The NCB 40kW Combi is a gas-fired, wall-mounted condensing boiler that has a high seasonal efficiency rating of 93% and ErP A rating for heat and hot water. Designed and manufactured by Navien, this 40kW model is perfectly suited to larger homes with 2 or more bathrooms that have a high demand for heating and hot water. Should your home not need a boiler with such a high output, the NCB Combi range also includes a 24kW model for homes with 1 bathroom, a 28kW boiler for medium-sized homes and a Combi with a 34kW output, also good for larger homes. 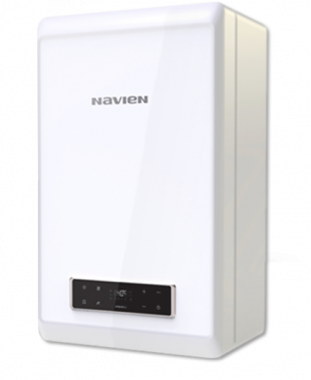 Should your home have a high demand for heating and hot water, you might be better suited to a System boiler, which Navien also manufacture. Navien’s NCB Combi boilers come with a primary and secondary stainless steel heat exchanger, helping to prevent corrosion which will extend the boiler’s life and being OpenTherm ready helps cut the costs of installation. Some more features of the NCB Combi include a full-modulation system that continuously optimises its heat output, extended venting up to 20m for flexible installation, optional outdoor weather sensor, a self-diagnosis and error feedback feature, for quick troubleshooting, and a stylish touch-type control panel for complete control over. Plus, the NCB 23kW is able to regulate the heating temperature according to changes in outside temperatures. Combi boilers supply hot water and heating on demand using the water supply from the mains, which means that you don’t need to install any bulky tanks or cylinders, making them perfect for smaller homes where space is limited. The Navien NCB 40kW Combi comes backed by a 7 year warranty that will mean you’re covered long after the installation has taken place.